Today’s App of the Day is Shopping List Free (Grocery List) by Hensoft. I don’t know about you, but before going to the grocery store, I like to make a list and check off the list as I go. I used to do that with paper and pen but I find it easier to have it on my iPhone and check them off as I am shopping. Once I started looking for a Shopping List app, I stumbled on to the Shopping List Free app. The app is free and it is very easy to use. 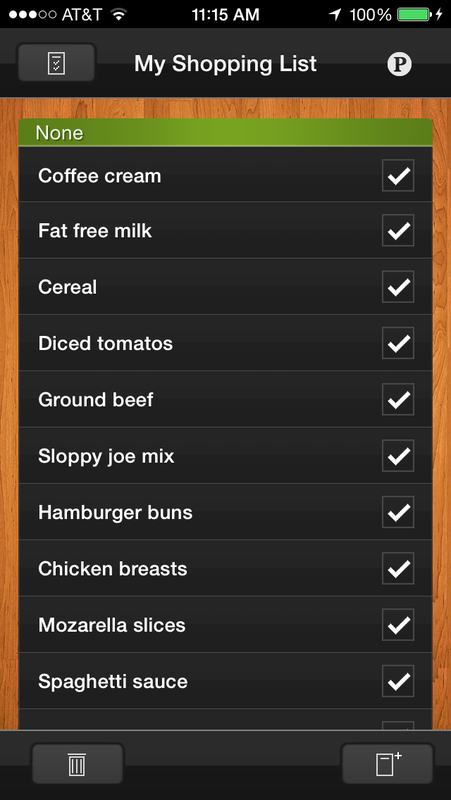 Simply create a Shopping List, add items and as you are in the store, simply tap each item to check it off the list. Once you are done, you can clear the check boxes to reuse the list again later. It also remembers all of the items in the list and you can create a new list from an existing one by selecting them instead of having to type them all in again. If you are interested in this app ,check it out here: http://bit.ly/1DqGQEo. Enjoy! This article was brought to you by 2HourAppreneur, makers of the aMemoryJog Password Manager app. A few times a week, 2HourAppreneur publishes an article or app that we think is cool, thought provoking, motivational, or makes life more fun and a bit easier. Sign up for these articles via email here. This entry was posted in Cool Apps and tagged 2 hour appreneur, 2hourapprenur, app of the day, appreneur, Article of the Day, DIY, iphone apps, life design articles, life hacking articles, password manager, shopping list app on October 29, 2014 by Steve Miller.